Principal, Acharya Narendra Dev College. Dr. Savithri Singh, Principal, Acharya Narendra Dev College (University of Delhi) since more than 12 years, is a botanist by training, but over the years her interests have diversified into science education, Open and accessible education, environment, entrepreneurship, women’s issues and theatre. Her philosophy of providing opportunities ‘Beyond the classroom…’ and ‘Preparing for the future…’ have ensured that faculty and students in the college are able to explore their full potential and make informed decisions. The college is well-known as a research hub both for UG students and the faculty. AND College has been recognized by the Government of the NCT of Delhi for a Business Incubator – inStart Foundation. Dr. Singh has led the college to be awarded Grade ‘A’ by NAAC with a score of 3.31. 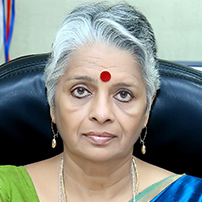 Dr. Singh is recognized as an UNESCO expert on Open Educational Resources and travels around the world in connection with her responsibility as the Creative Commons representative in India.